Dexcom Reviews - Will It Help You Track and Manage Your Diabetes Better? Instead of constantly pricking your finger using blood glucose monitors, the Dexcom G5 continuous monitoring system incorporates a weekly under-the-skin sensor and a smartphone app. By combining a small, under-the-skin sensor with a receiver or other smart device, Dexcom’s patented, FDA approved continuous glucose monitoring (CGM) system promises to help you easily make diabetes treatment decisions, while avoiding rollercoaster highs and lows. Together with the fact that Dexcom is approved for use in children as young as two years of age, can help aid in the detection of hyperglycemia and hypoglycemia episodes, and can share your information with loved ones to help successfully manage your diabetes, the company tells us theirs is the best selling, most preferred CGM on the market. There’s no doubt that diabetes management is all about tracking numbers, but can the data provided by Dexcom’s CGM deliver a more complete picture than the competition? That’s the central question we’ll help you answer here. The Centers for Disease Control and Prevention explains that our body breaks down most of the food we eat into glucose, a type of sugar, which is used to deliver the energy it needs. However, cells only allow glucose to pass through their walls—and therefore process it into energy—after the hormone insulin has attached to the appropriate receptors. On the other hand, type 2 diabetes, which accounts for 90 to 95 percent of all cases, is not necessarily insulin dependent and can often be mitigated—or even reversed—through a combination of healthy food and exercise choices. Although diabetes often doesn’t exhibit symptoms until an individual falls ill or experiences side effects, blood glucose tests can help your doctor diagnose the condition in advance. More recently, and as mentioned on the Dexcom website, A1C tests that measure hemoglobin levels can also be used, which report your glucose levels over the course of three months. What’s the Difference Between Continuous Glucose Monitoring (CGM) Systems & Blood Glucose Meters (BGM)? For most individuals with insulin-dependent diabetes, accurately monitoring their blood glucose levels involves pricking their finger, placing a drop of blood on a testing strip, and having their readings taken by a blood glucose meter anywhere between two and 10 times per day, depending on their doctor’s treatment plan. This way, instead of waiting an hour or more between each blood glucose test, which will only provide a snapshot of your levels at any one time, CGMs like Dexcom can provide readings every five minutes, up to 288 times over a 24-hour period. Together, CGMs have been shown to help provide active monitoring at night, reduce hypoglycemia, and decrease A1C an average of 1.3 percent in type 1 diabetics. How, exactly, does the Dexcom system accomplish this? While you can reach out to the company for additional information and see if you qualify for their G5 system, it requires a prescription, so it might be ideal to speak with your doctor in advance. Sensor – A tiny, flexible device that’s inserted under the skin using a special needle that measures glucose levels and remains in place using tape-like adhesive for up to seven days. Transmitter – This wirelessly sends readings taken by the sensor via Bluetooth to your receiver, or iOS or Android smart device. Display device – Allows you to view and track your glucose level trends in real time and vivid color. Once set up, the under-skin monitor will take glucose readings five minutes apart and send them to the device, so you can see how your levels are trending over time. Important: While this system might help users go as long as 10 hours without having to prick their finger, the website’s FAQ emphasizes that you’ll still need to calibrate with a finger stick twice per day. Red means you’re below your set target rate. Yellow means you’re above your set target rate. Gray means you’re within your target range. Arrows will also display the speed and direction your glucose is heading: Two down arrows mean you’re dropping fast, while one arrow down means you’re dropping more slowly. You can also set customizable high and low glucose level thresholds, which will alert you when you're at or below a lower threshold, when you're trending up or down, or when you're out of range. These can work as audio and vibrate alerts, or as text messages. 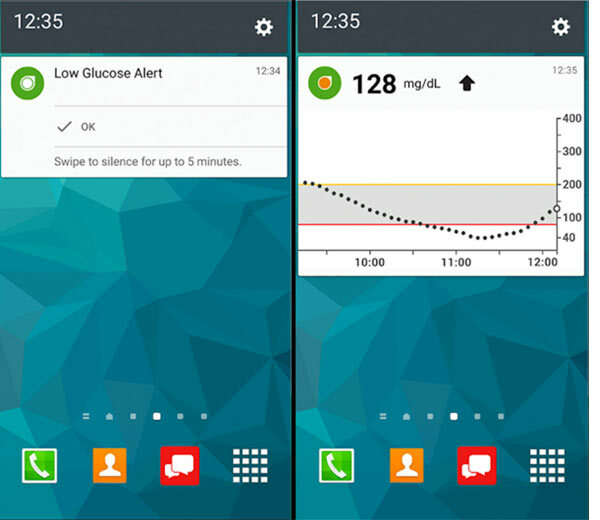 If you prefer, Dexcom’s built-in Share feature helps up to five other individuals co-manage your diabetes by receiving these same alerts, who can also see your glucose levels in real time on their compatible smart device. Together, the company advertises that you’ll be able to view trends over time, whether online or via the app, detect patterns (e.g., spiking or dropping during the night), and make better diabetes treatment decisions. Pattern Map – Tracks the frequency, duration, and intensity of glycemic excursions. Hourly Stats, Daily Stats, & Daily Trends Reports – Glycemic patterns and variability, as well as the percent time spent high, low, and within target glucose ranges. Glucose Distribution & Trend Reports – Helps assess pre- and post-prandial control by displaying overall glucose distribution, "event markers and the correlation between SMBG and CGM." Success Report – Allows you to compare glycemic control on a weekly, monthly, or quarterly basis. 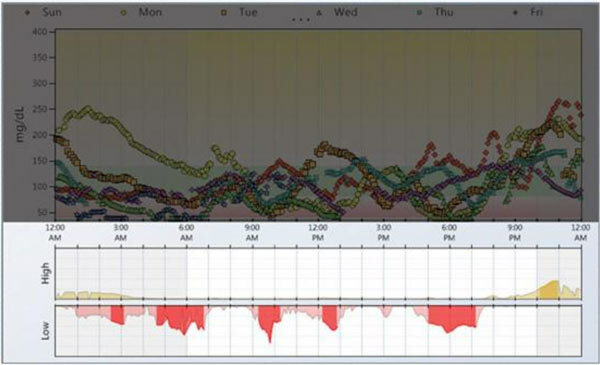 Dexcom’s Pattern Map shown above, which is part of the company’s STUDIO reporting system, allows users to track their glycemic excursions. Credit: Dexcom, Inc. The cloud-based version of STUDIO, which provides the same ability to “access and track your glucose data anywhere, on any web-based platform,” but that’s targeted toward Mac users. 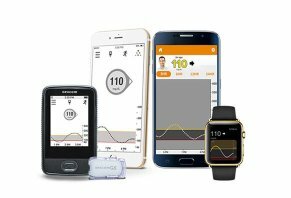 While Dexcom’s G5 sensor will send the information it gathers directly to your device, their Follow app allows up to five other people to remotely monitor your glucose data and trends. Could Dexcom’s G5 System Cause Side Effects? Although Dexcom’s G5 is the “the first FDA-approved continuous glucose monitoring system that can be used to make diabetes treatment decisions without confirmation with a traditional fingerstick test,” it’s not for everyone. For example, it can’t be used by children under the age of two, pregnant women, or by those on dialysis. The sensor also must be removed before undergoing an MRI or CT scan, and can only remain submerged in water for less than 30 minutes (in case you plan on going swimming or taking a long bath). Finally, users are instructed to never use the same insertion site twice in a row, which could result in irritation. You’ll need to get a prescription from your doctor in order to purchase Dexcom, at which point you should discuss these and other potential side effects based on your specific diagnosis. How Much Does Dexcom Cost? Since Dexcom’s G5 is a prescription-only system, a pre-approved account is required in order to access their store and related product prices. To request one, you can fill out a form on the company’s website, which involves entering personal information and brief details about your diabetes therapy. No prices are listed on the Dexcom website, although their FAQ indicates the system might be eligible for coverage for qualifying patients (typically, those with type 1 diabetes, or those with type 2 diabetes and who take insulin with every meal) under some Medicare plans. There also weren’t any refund details were provided, although each mobile transmitter is covered under a three-month limited warranty (beginning from its first date of use) against defects in material and workmanship under normal use. If you need to process a warranty claim or even need help setting up your device, the 24/7 support and diabetes coaching team can be reached at customerservice@dexcom.com. Their website also offers several guides and tutorials. What Can We Learn From Dexcom Customer Reviews? Between iTunes and Google Play, we encountered nearly 900 combined customer reviews at the time of our research, who had given the Dexcom app an average rating of about three stars. Although only a handful provided direct feedback, common compliments cited insightful information, while complaints often regarded bugginess, as well as missing important details (e.g., no values for carb and insulin entries, the ability to add unlimited custom schedules, readings only go up to 400, etc.). A company representative responded in each instance. We found a handful of hands-on Dexcom system reviews on other sites, although the majority referenced the previous G4 Platinum version. However, TheDiabetesCouncil.com’s Bridget Montgomery provided some in-depth insight earlier this year, stating that it was simple to use and easy to calibrate, although they noticed the app depleted battery life faster, along with limited Bluetooth transmitter range (five to 10 feet). From a company perspective, Dexcom, Inc. was founded in 1999 and is based out of San Diego, CA. They held a D- rating with the Better Business Bureau, based on 12 customer reviews and 25 closed complaints, as of 3/19/18. Most referenced support issues, and the company hadn’t responded to 10 of these complaints at the time of our research. How to choose the right one for you? Like many other consumer products (health-related or otherwise), it’s largely going to come down to your needs and preferences. For example, at $69.99 for the reader and $25.99 for each sensor, the Freestyle Libre is the lowest priced CGM above. Functionally, however, it’s perhaps the most limited (we didn’t test any of these devices firsthand to provide direct feedback), since there’s no app connectivity and you must manually scan the arm-based sensor in order to download data. With the reader, you’ll also have one more electronic device to keep track of. On the other hand, if you want an app-based CGM and want it now, the Dexcom G5 is the only game in town, since the Medtronic Guardian won’t be available until summer 2018. You’ll have to pay a not-insignificant amount for the sensor, though, and each one is more than three times the cost of the Libre version. They only last seven (versus 10) days, to boot. But as mentioned on Dexcom’s website, their system is currently your only option if you’re under the age of 18, or if your smart device works on an Android platform. Speaking of the Guardian, it’s perhaps the closest in functionality to Dexcom’s G5, as well as sensors that are very close in price. However, the first transmitter will cost you $700, which is significantly higher than the competition. Compared to traditional blood glucose meters, continuous monitors offer several potential advantages, including less finger-pricking, more frequent measurements, and detailed software that can identify and predict trends, all helping you to better control your diabetes. But, when trying to figure out which option will deliver the most value for the money, can you expect the Dexcom G5 system to deliver a more complete picture than the competition, as claimed on the website? Again, we didn’t test any of these devices ourselves, but if you’re looking for app connectivity, detailed reporting, and sharing ability, it’s currently the only option until the Medtronic Guardian releases later this summer—which will also be priced meaningfully higher at $799 for its receiver. Together, as reported in The Diabetes Council article cited earlier, if you’d prefer not to carry an additional receiver, are a parent or caregiver of someone with diabetes, would like the most insight into your diabetes management, or are a heavy sleeper who has trouble waking up to alarms, it might be difficult to go wrong with Dexcom—especially if you're covered by private insurance or Medicare. Just remember that it’s not a one-time purchase since you’ll have to pay about $75 per month for replacement sensors. Stay away from this company. As a primary care physician and a type 1 diabetic using an insulin pump, I have been using Dexcom only because I realize the benefit of continuous glucose monitoring and am on Medicare, so it is one of the only systems covered by insurance. 1. Customer service is non-existent. When you call you will be diverted to a person in the Philippines who is unable to solve any issues. Your account manager will be in Mexico. I tried to call today and let it ring 25 times. No answer and no voicemail. Good luck trying to solve issues with them. 2. Six weeks and waiting for my reorder of supplies with no clue when they will arrive. 3. Inferior product. Sensors are supposed to last for three months and never do. Eight weeks average. Good luck trying to get a replacement. The system is not very accurate. Bottom line is, there are better products available and if you can afford out of pocket or you are lucky enough to have insurance that will cover a different product, don’t think twice, avoid this one. It is not worth the frustration of dealing with this company. There really should be a zero star rating because Dexcom has truly earned it! If you can avoid customer service altogether, I would give it three stars, but unfortunately, you can't. If this company supplied Aspirin or Band-Aids, they would've gone out of business years ago, but they supply potential life-saving devices and handle it with the utmost disregard for all customers. The wait time just to talk to someone can take up to forty minutes, and if you leave a call back number in which they promise to get back to you in thirty minutes, you will be lucky to ever hear back. Once you finally do get connected and transferred several times waiting even longer for someone to pick up, you will find out nothing, or worse, a completely false story. Days and weeks later when you don't receive your life-saving supplies, you can go through the entire process again. You constantly get email reminders of upcoming prescriptions needing your doctor's approval, or you need to update your payment method, and when you call you will be told to just disregard the emails. If you try to order anything online, you will find that there is almost always a problem and additional information needed and your back to calling. I've been a Type 1 Diabetic for 36 years and I have never had to work with such a completely inept, insufficient and unequipped organization. I have found the device somewhat helpful but will no longer continue to order supplies because you can't count on anything they say or do. If you decide to order anything from them, don't say I didn't warn you! I may die before I receive it. Unless you plan on buying it cash, it takes an act of Congress to get it. I've been trying to get mine for 5 months now, using insurance. Finally, found out the only way to get it (using insurance) is through "Dexcom.com." Started the process in January. Almost three months later, many phone calls and got it approved for ONLY one month of usage. But it was approved ten days ago and still no one at Dexcom.com is calling me back about my order. Just stick to poking yourself, it less stressful than their awful service. It took Dexcom over 4 months to process my order even though they already had approval and documentation from my insurance company and physician. They sent the wrong system. They lie about everything, and when you try to order your replacement transmitter, I wish you all the luck in the world getting it. I have been trying for over a week to get the order placed, and after several hours and three phone calls, they still have not placed the order. Then they hang up on you. All they care about is taking your money, not the patient. They lie about insurance coverage and refuse to transfer you to a supervisor when they can’t or won’t process your orders. Horrible company, and good luck reaching someone that speaks understandable English. My doctor sent a prescription on 2/27/2019, and I placed the order on 2/21/2019 since my G5 transmitter expired and the battery died. My insurance has approved it for almost a year. Today is 3/13/2019 and all I have been told, "we'll ship it overnight," I called almost every day, the same lies. Backorder, we will ship it tonight, I get treated like I’m asking for charity. My doctor called them Monday after she found out I was hospitalized for diabetic coma. They assured her the same lies. I regret I got this Dexcom. I will advise any new patients don’t believe Dexcom sales rep and customers service, they are trained to lie. I have gone through the run around with this company many times, but my most recent experience has been the worst by far. I called to reorder my supplies three weeks ago. They said I had a zero copay and then confirmed my address numerous times. I hadn’t heard or seen my supplies delivered after a week. I called again to check the status. I was informed that they were delivered (that was a lie). The gentleman then read me the shipping address which was confirmed numerous times previously. They shipped my supplies to someplace in San Diego. I’ve never lived in California so how they messed that up so badly is astounding. I was told it would be corrected but is now on backorder. Oh and now they’re charging me $150 because magically I have a copay now. I told them I wanted to speak to a supervisor immediately and was given an email address...Never heard back from them or anyone else in the company. I called again this morning to find out what was going on. Still magically owe a copay, and they’re still on back order. They are in the business of supplying one product and one product only, and they’re out of them. How is that even possible? They’ve been on a 10-day backorder for the past 30 days, complete garbage. I still haven’t heard from a supervisor or even an apology. If my insurance would cover a different CGM, I would tell this company to piss off. Poor management or is it NO MANAGEMENT? After being on hold in excess of 39 minutes my call was answered by someone identifying himself is Alec or Alex. He asked how he could help me and I responded by telling him that I had a problem getting my supplies. At that point, which was exactly 8 p.m. EST, the line went dead. I immediately called back and got a recording: "it was after business hours and to call back during business hours." On my previous call a week earlier I explained that I was completely out the sensors. I was promised to have the sensors in a few days as they would Express ship them to me. If they treat their employees like they treat their customers, this company is doomed. Good product! BAD customer support. No major complaints about the product, but dealing with anyone at Dexcom is the worse! They are polite and all but NO RESULTS, and it’s like talking to a black hole. 6.5 week’s from the first time I called to place an order and still the supplies haven’t been shipped. Even if you get to the point of “your order is being processed and getting ready for shipping,” it will still take forever. Doesn’t matter that you are “priority,” still no real rush or results. I’ve been calling every day for the past 10 days and have waited over an hour at times. Doesn’t matter how good the product is, it’s not worth the headache or stress. I’ll be looking for a different company that deals better with their customer. Nice product. Really, really bad customer service. I have been a diabetic for over fifty years and need a device such as the Dexcom to alert me of highs and lows. The product works well. The customer service is the worst I have ever seen. They even told me one time that they were not considered a medical necessity by the FDA so they didn't have to follow medical guidelines such as shipping in a timely manner. They never let you know if there is a problem with the order, it just sits until you realize it's not coming. I complained many times to deaf ears, this company is being mismanaged and it is a shame. Not sure how they can continue. First, the product is great, it has given me a peace of mind like no other diabetic device. In one of the reorder evolutions, Dexcom insisted that my doctor write another script even though the current prescription was still valid. My doctor refused and the battle was on, for months. Eventually, I had to pull the patient welfare card, and pleaded with my doctor to write another script and insisted that I was the one suffering from his refusal to write on a piece of paper. He insisted that I filed a complaint with the state. I fired him and sought the help of another Endo. Come to find out my doctor wasn’t the problem, it was Dexcom. Every reorder. and God forbid a new script, insurance reauthorization, there is a major issue. On average I spend three hours talking to Dexcom’s reps for each order. I should be paid by Dexcom as much as I’ve been on the phone with them. I can recite their hold music, "Opus No. 1" by Tim Carlton & Derrick Deel in my sleep (it sounds like it belongs in a bad 90’s movie). In defense of the Dexcom reps, they have been nice but lack the ability to do anything correctly. I’ve had them mistake a third party biller for my insurance, try coding me on Medicare, and one time they were going to ship the devices to my insurance company. It’s a shame, not sure how long they can go on like this. The receiver can be up to 120 points off. Customer service is the pits. You can wait for over 2 hours to order supplies...and then the order doesn't show up. Just try getting through to complain. Write a Review for Dexcom!